If, like me, you spent summers on a small island off the Jersey coast, and if your family, like mine, was of Italian descent, and if you had an aunt like my Aunt Helen, the words “egg parm” could make you actually drool. 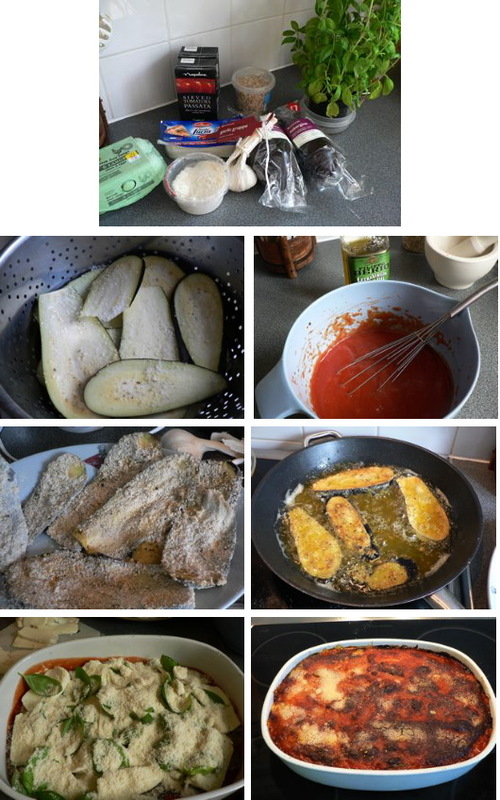 It translates to Eggplant Parmigiana and will never be “aubergine parmesan”, just like for me it will never be “courgette” but always zucchini. It takes a long time. It is def. a labour of love. But when it comes out of the oven, when you cut in to it, when you taste that first melting bite, you know it was all worth it. Vegetarians, take note. Vegans, look away now. This is NOT a photo of my egg parm – I don’t style my food, so it doesn’t look nearly as good on the plate as this one does, but I bet it tastes better. Start by salting and draining the eggplant – do NOT be tempted to skip this step. Slice the eggplant in 1/4 inch slices, and layer them with salt in a colander. Put some greaseproof paper over the top layer and weight it down (I put a few plates on the top then put the cartons of passata on them) and leave it for a couple of hours. Put the egg mixture in one shallow bowl, the breadcrumb and flour mix in another. Have it all on the counter, eggplant slices. egg mix, breadcrumb/flour. Now, like an assembly line, dip the eggplant slices in the egg, then coat in the breadcrumb mix, then slip them into the oil, a few slices at a time, and fry till golden, turning it once. Take the slices out and drain on paper towels. Once all the slices are fried, preheat the oven to about 160 to 180 degrees depending on if it is fan assisted or not. Get a big baking dish (about 10 x 15 and a good 3 inches deep) and put about a cup of the sauce in the bottom. Layer up 1/3 the eggplant slices, 1/2 the mozzarella, 1/2 the basil leaves and 1/3 the grated cheese, top with 1/2 the remaining sauce then repeat, and end with a layer of eggplant slices topped with the rest of the sauce and parmesan cheese. Pop into the oven for about 30 minutes till it is all hot and bubbly and the cheese on top is slightly brown and crispy. Let it rest at room temp for 10 minutes or so . I can hear it calling to me from the fridge…. THIS is what mine looks like and it was delicious.